The quake was not what we were told. In fact, the quake was a bold faced lie, packing a political agenda. There is even more proof now, and it goes beyond the linked Japanese chart. This original seismic data is the smoking gun, however, I have something better. I finally suppressed the urge to vomit and analyzed the lies told by the USGS, and from them wrote this sad, sad story about how it really was, not what you will see in the video. Keep in mind that precise top speeds of flying debris cannot be determined with accuracy, but this story will at least be close to the numbers put out by the USGS. he people in the newsroom did not die, this story is what would have happened if the USGS charts were true. Meet Atsuo, Airi, and Akiyoshi. They were all the best and most dedicated people at the NHK newsroom, in Sendai Japan. Akiyoshi loved Airi, and Atsuo was the one who introduced them. Unfortunately, all 3 died in the quake.Akiyoshi got a severe cut and bled to death when he hit a display screen behind him at 44 miles an hour, and was then thrown out through a hole in a collapsed wall. Airi followed pretty much the same path, and died beside him in the rubble. Atsuo flew through the open door behind him, then crashed through a window and was crushed when he landed in a massive seismic crack in the road, which closed in on him. Others in the newsroom died also, but I never thought up names for them. At least, according to the official USGS charts. The laser printer was never found, but the table it was on ended up on top of the rubble, smashed to pieces, where one of the few survivors used a piece of the metal frame to splint his broken leg. Chart prepared by Erol Kalkan, Ph.D. USGS, Official Release. According to these chart, every one in the room hit the East Wall at 44 MPH, and then bounced to the South at 28 MPH. Every one died. The leaser printer, AFTER those “graphs” !!??!! ONE HAPPY PRINTER!! Also, note that most of the stuff stays on the desks, at the end, a laser printer is still sitting on a cheap table, ect. some things fall but things return to normal quickly. all the while the English announcer is reading a script of devastation with all the pep of some paid fool who does not believe what he is saying in a cheezy infomercial. The quake was significant, but only in a 6.0 sense, as recorded by the seismographs. This is important footage, because it proves the earthquake measured at a 6.8 was an instrumentation based richter reading. Confusion between the Shindo and Richter scale is being used to cover this up. I chose this video because it’s location is documented to have been the worst affected, and was recorded in a news room with a known fixed location. Remember that this video is proof of what really went on. This means there never were significant aftershocks, never was a natural tsunami, and if they lied about that, what else? This video is pivotal and vital to exposing the truth. Sure there was a quake, but at this newsroom it was not much over a six if it even was a six. 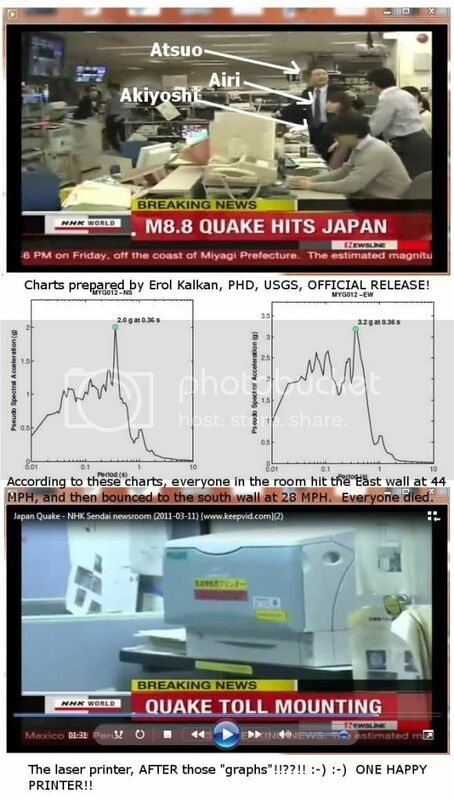 I chose this video because the news room is within eyeshot of station MYG012, which was used by the USGS to make these graphs which represent an 8.8, as was stated in this (English) newscast and was probably used as a guide to fudge the lie due to the closeness of the newsroom to the seismic station. Looking at these charts, it is super easy to get a rough guess at how fast people would have flown. 44MPH to the North, and 28MPH to the East. Those are not precise numbers but the charts are proven wrong by the video because according to the charts people should have entered uncontrolled flight. Here is the full chart put out by the USGS Of course, they offer no reading from MYG011, which was closest to the 9.0 “epicenter” by a long shot, because it only got a 5.63’s worth of shaking. I will do that work for them. That map is below. All we have, all the pictures are tsunami damage. Let’s see pictures of quake damage. The Kobe quake was a 6.9/7.2 depending on source. That makes this quake, at a 9.0 100X as powerful. Sendai was near the epicenter and would have been devastated if it really happened. Look at the earthquake photos of damage from the Kobe quake, and try to find ONE THING SIMILAR in SENDAI. Just try. They do not exist. Outside of the tsunami, the quake which supposedly hit Sendai with many times the power of the one in Kobe, did not destroy a single building there. Sendai was only 48 miles from the epicenter of this “9.0” which would have devastated everything in an area 1,000 miles across if it was real. All of Japan would be toast. Try to find a photo of seismic damage in Sendai. I challenge you. Try to find it in any of the coastal cities, as little as 25 miles from the “epicenter”. I looked for 5 hours, and except for some tanks that fell at a brewery not a single one exists. No pictures of collapsed skyscrapers or high rises equals NO 9.0. You will not find a single skyscraper photo where the windows got broken either. You will find no downed power poles, no flipped over cars, no uprooted trees, no derailed trains (except for one the tsunami hit), and the road damage is typical of even a 5.0. You will not find pictures of a single damaged multi story building or even a structurally damaged wood framed house outside the tsunami zone. In Sendai the quake messed up grocery stores and kitchens and that really is about it. I believe the phony 9.0 story was used as seismic cover for a tsunami nuke, which produced the tsunami of a 9.0 when detonated in the Japan trench (where no earthquakes of significance happen) as punishment for Japan offering to enrich uranium for Iran. The rest of the story, the concealment, is black ops. Bet on it. In the tsunami videos, the tsunami rips through pristine and undamaged cities, where business as usual is obvious and the tsunami is an ambush; not 9.0 earthquake ravaged debris. The quake is a paper thin story taped together by the undeserved trust of a gullible public. And the stories? The CIA did not hire a million people last year for nothing. If there is evidence of a 9.0 SHOW ME. A 9.0 will devastate an area over 1,000 miles across. That is how big a 9.0 is. The entire nation should be in ruins, especially judging from the damage the 6.9 Kobe quake did, and no where, no where outside the tsunami zone in the entire country is there a single damaged multi story building, a single collapsed bridge, a single structurally damaged wood framed house, or skyscraper. If a picture exists that can be definitively pinned to this quake, show me. The only collapsed structure in all of Japan was an old welfare shelter near station MYG004, the true epicenter. Take a look at these frame captures,and ask a question – Why is no one trying to run? Why are the cars all just parked peacefully as the tsunami arrived? Why was there no warning?Why did the tsunami sirens only go off after the tsunami arrived? Could it be that the people and the governement had not felt a significant earthquake and did not measure one either? Could it be that the people and government were not expecting one? Tsunami sirens blare only when it arrives, rather than 40 minutes before, which is how much warning they would have had if a real quake in the ocean had been detected.